The Russell Hobbs K2 was the first kettle that switched itself off when the water boiled. To many people it was a much loved old friend. In recent years it has become the most desirable kettle that everyone wants in their kitchen. The K2 was a premium product; it was just about the most expensive kettle you could buy at the time. 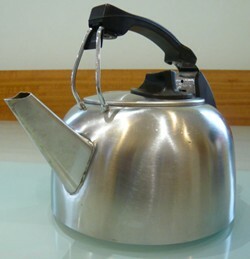 Before the mid-1970s it was the only kettle that could switch itself off, known in the trade as an automatic kettle. It was well made and had a reputation for longevity that the jug kettles which superseded it could not compare with. Many people are still using K2s more than thirty years after they first bought them. Today it is by far the most collectable mass-produced kettle. The Russell Hobbs Company was the partnership of William Morris Russell and Peter Hobbs. They both served as majors in the army during the Second World War and they both joined Morphy Richards soon afterwards, with Peter Hobbs becoming managing director of Morphy Richards in South Africa and William Hobbs working as an engineer and designer. Peter Hobbs parted company with Morphy Richards to join another firm. He later contacted Russell to help develop a ceramic electric coffee percolator. Both men decided they would do better on their own and formed Russell Hobbs, the perfect partnership of salesman and engineer. Although the coffee percolator did quite well in the prosperous 1950s, it was their next product, an electric kettle, which really took off. Russell's first electric kettle, the K1, had a vapour control system which switched the kettle off just as the water came to the boil. This was revolutionary; no other kettle had such a system and it was so easy to forget and leave a kettle to boil dry. Later advertising called the K2 the Forgettle. The K1 was a bit of an ugly duckling and Russell, who always believed that well designed products sold themselves, improved the design to create a design classic in the K2. The company launched the K2 in 1960. 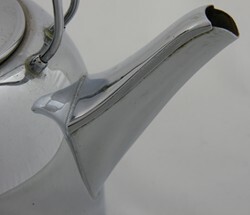 It achieved a place on the coveted Council of Industrial Design (COID) index, only one of two kettles in the 1960s. In 1963 Russell and Hobbs sold Russell Hobbs to Tube Investments (TI) which ran the firm as a separate business until the 1980s. The K2 also continued and was improved along the way. A new model the K2R, 'R' for rapid, had already been launched in 1962 and a new stainless steel model, the K2S, joined the K2R later in the 1960s. In 1982 Russell Hobbs finally replaced the K2 with the K3. 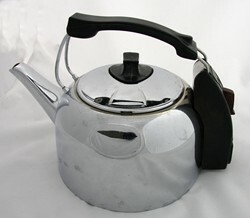 A similarly solid and well engineered product, the K3 continued to sell well against modern opposition in the form of the plastic jug kettle. All K series kettles have the model number on the base so they are easy to identify. The first version was launched by Russell Hobbs in 1960. It was made from chrome plated copper. In the post-war era chrome plated copper replaced traditional Victorian style copper. The original K2 had a 1750 watt element and could hold three pints of water. Later in the 1960s the K2 was phased out. So all K2s date from the 1960s. How do you identify a K2? K2s are always chrome plated copper. They have a curved spout (see photograph, above left). Very early models have a 2 pin electric plug socket connector. Later versions have the round 3 pin type. Look out for early versions that have 'Patent Pending' on the base. The patent was granted in 1962. It is likely that the patent would have been stamped on the base soon after. Also look out for blue lettering and the fancy script Russell Hobbs logo on the back of the plastic cover above the plug socket connector (see photograph, right). Later kettles had white lettering and the logo disappeared (see photograph, right below). The K2R was the definitive Russell Hobbs kettle. It was an improved version of the K2, with a 2400W, element and it remained in production from 1962 until the K2 was phased out in 1982. Older versions, pre 1979, had a curved spout; later versions had a straight spout. Otherwise it was pretty much unchanged from the original design. Sometime around the end of the 1960s, Russell Hobbs added a new model to the K2 range, the K2S. 'S' stood for stainless steel. It had the same 2400W element of the K2R and was finished in brushed stainless steel (see photograph, left). Like the K2R later versions had a straight spout (as in the photograph, above left). This must be the rarest K2. It was finished in chrome plated copper and had a white handle, white cover for the thermostat and a white knob for the lid. I have seen pictures of a copper one as well. This may have been a factory one-off. I know very little about the K2P (see photograph, left). It appeared towards the end of the K2 production run, probably in the 1980s. I am surmising that P stood for polished and it was stainless steel in a polished finish. The K2P had a straight spout and a squarer handle on the lid to the older versions. There also appears to be no vent on the lid. K2 values have increased in recent years. It is important that kettles are in working order with no leaks and have no major damage. Some signs of wear on older models are acceptable. Can you repair broken K2s? Russell Hobbs Futura - the replacement for the K2? "I have a brand new in the box with guarantees ( obviously not valid ) model K2 P...Never used..
"My parents bought their first Russel Hobbs kettle (a K2) in UK around 1963, if I remember well, and it is still working every day, even if some wear is now visible (the small bars fixed by bolts are slightly moving and some drips of water sometimes leak there, nothing serious really). We bought three other K2R, one still in its box, and I keep them should my "old" one ever fail, but I believe it will live longer than me (I'm now 67). I'm just looking for the small black plastic feet as a stupid maid once tried to boil water putting the kettle on the electric stove! It still worked afterwards but the feet are seriously damaged, showing the metal underneath. I have a K2R. I need to reassemble the switch unit after a screw came loose and I had to retrieve it. Do you know if there a diagram is available showing how the internal parts fit together. "Unused K2P now on Ebay. Lid looks like it is plastic but I think that may just be the reflection. Shows that it is actually vented with the vent integrating into the squarer handle. "We moved to the States from London in 1971. My father had a local repair shop re-wire our K2 to work on 120 volts, and we used it into the '80s when it finally died. "Hello Steven, I have been asked to sell a boxed, unused K2S kettle with a curved spout for an elderly lady who does not have a computer. It has the the fancy script Russell Hobbs logo and name engraved on the back, but is not coloured in, and it has no plug. 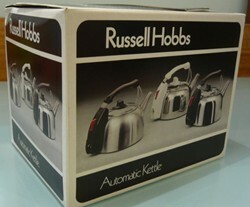 The box is plain brown cardboard but printed with Russell Hobbs logo and kettle capacity and rating, 3 pints, 2.4kw, 240v. Can you tell me its approximate age, what I should ask for it and whether I should fit a plug ? Any advice would be appreciated. "I am trying to find a price for an electric kettle that could be used as a prop for a play set in the early 1960s. Would be really helpful if anyone knew a price range for this or where one could be sourced? "Fascinating website! I'm really pleased I've found it. "40 years ago I purchased the Russell Hobbs K2 electric kettle in Brisbane Australia. It was sold in the city at what was the Sunbeam shop. It has been in use all this time & I have had the element replaced twice & the cord replaced once. On the bottom of the kettle it says Vapour controlled produced in New Zealand under licence from RUSSELL HOBBS Limited. Type 2 Capacity 3 Punts. 240V 50 cycle 2.4KW. APP NV75348. Made by CS agencies Ltd Christchurch. Last week it stopped working so I am waiting for the repair people to open after the Christmas break. If anyone has a new K2 Kettle ( chrome finush) or a hardly used one I would be happy to buy it. The spout on mine has significant calcium build up on the outside which I am reluctant to remove as it suggests it is quite fragile. I brought this kettle with my fortnightly pay check when I was 18. I love the look & the longevity. "Does anyone know a source for a replacement switch assembly for these models? I have MODEL 4100 but I believe that the same switch assy. was used in later models as well. PS. A response to Cecilia Dunne's comment on 02/01/2019. I usually use white vinegar to de-calcify my kettle interior (takes about 10 minutes) but beware when using it on the calcium build up on the exterior of the spout seam joint. A small leak appeared on mine and it took at least 24 hours for the leak to calcify again. No problem since.